Friday, the City officially welcomed Oreo, the new mascot of the Fire Department. 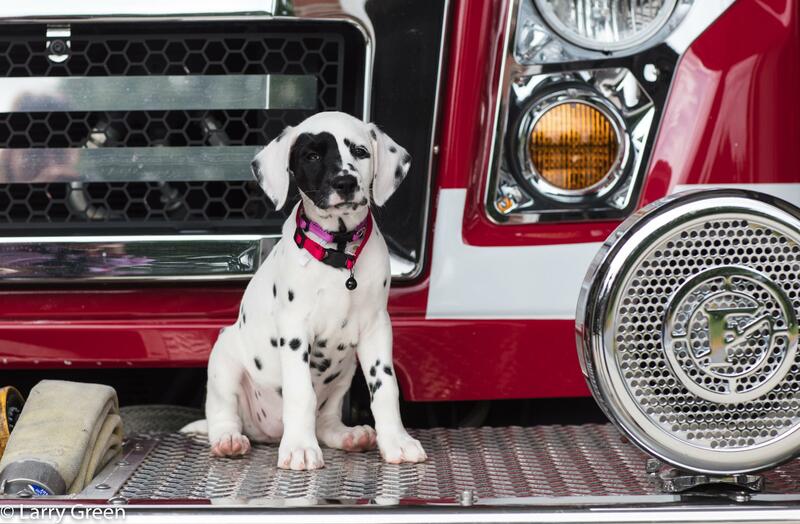 Oreo is an 8-week old full-blood Dalmatian puppy who will live at the fire station full-time. After she attends obedience school, she will tag along with firefighters to schools, public events, and festivals to raise awareness about fire safety and to be a presence for the department. Chief Billy Mattingly decided that the department needed a dog shortly after being sworn in earlier this year. Oreo has been a great morale booster among the firefighters and has already gained a large following from the public and the news media. Her Facebook and Instagram accounts already have around 850 and 380 followers. At the official welcome ceremony, Chief Mattingly and Mayor Heaton gave remarks on the addition of Oreo as a welcome change to the department, and the general excitement over having a mascot. Mayor Heaton stated when the chief approached him about the idea of getting a dalmatian puppy and offered to pay for Oreo out of his own pocket, he couldn't say no. Since its inception, the Bardstown Fire Department has never had a dog and Chief Mattingly thinks that a mascot is an important tool to connect with the community. Chief Mattingly stated that he wants Oreo to really be the people of Bardstown's dog and when Oreo is taken to different local events, he hopes people will recognize her and feel a sense of pride for their fire department.